When news broke of the alleged racist attack on a star from one of the most popular shows on television, it riveted everyone, drawing the nation into a heated discussion about race, politics and celebrity. But as the investigation continued, growing skepticism about "Empire" actor Jussie Smollett's story added enormous pressure on Chicago investigators to get to the bottom of what really happened the night he reported being the victim of a street attack. On Tuesday, Smollett attended an emergency hearing with his lawyer during which all charges against him were dropped, according to the defense attorneys - a confounding end to one of the most bizarre and baffling alleged criminal attacks involving a Hollywood star in recent American history. The suggestion by Chicago police officials that the incident was a hoax infuriated investigators and much of America, devastated Smollett's fans and the various civil rights groups that publicly rushed to his defense - and nearly destroyed the promising young career of a man previously seen as a cultural role model representing a new generation of inclusion, diversity and tolerance. Here is a timeline of the Smollett case as it unfolded over the past several weeks. Jan. 22: Smollett reports to police receiving a threatening letter sent to the Fox studio where 'Empire' is filmed, containing threatening language and laced with a powdery substance investigators believe was likely crushed-up Tylenol. Jan. 29: Smollett is allegedly attacked at 2 a.m. near his apartment in Chicago. Two masked assailants poured "an unknown chemical substance" on him, possibly bleach, and wrapped a rope around his neck, he told police. In a follow-up interview with police, Smollett alleges that the attackers yelled "MAGA country," a reference to President Donald Trump's 'Make America Great Again' slogan. Jan. 30: Chicago police announce in a tweet that they are seeking two "persons of interest" who were captured on surveillance video near the scene and around the time of the alleged attack. Jan. 31: Smollett's family releases and emotional statement describing the alleged attack as a hate crime. "In the early hours of Tuesday morning, our beloved son and brother, Jussie, was the victim of a violent and unprovoked attack. We want to be clear, this was a racial and homophobic hate crime," the family wrote in the statement to ABC News. "Jussie has told the police everything from the very beginning. His story has never changed, and we are hopeful they will find these men and bring them to justice." Feb. 1: Smollett releases a new statement thanking his fans and reiterating that his account of the alleged attack has remained consistent. "I am working with authorities and have been 100% factual and consistent on every level," he said in the statement. "Despite my frustrations and deep concern with certain inaccuracies and misrepresentations that have been spread, I still believe that justice will be served." Feb. 2: Smollett makes his first appearance on stage since the alleged attack, performing at the Troubadour in West Hollywood, California. "Regardless of what anyone else says, I will only stand for love," Smollett said, tearing up before beginning his set. "We hope that you all stand with us." Feb. 4: Chicago police release the initial incident report about the alleged attack on Smollett. The report reveals that Smollett was apparently reluctant to report the attack, and that when police arrived at his home to interview him, he was still wearing the rope around his neck. The report states that a 60-year-old friend of Smollett called the police on his behalf and said the actor "did not want to report offense however he believed it to be in the best interest to." Smollett said the attack happened at around 2 a.m. as he was leaving a Subway restaurant. He told police that two attackers gained his attention by yelling racial and homophobic slurs and began to beat him "about the face with their hands," the report said. "The primary aggressor was wearing a black mask concealing any facial features and both offenders were dressed in black," according to the report. "The victim does not remember any other distinguishing features of the offenders, or in which direction they fled," it added. Ten days passed without any developments in the investigation into the alleged attack, prompting growing skepticism about Smollett's account on social media. Feb. 13: Unbeknownst to the public, Chicago police investigators had been tracking the two "persons of interest" and were aware of who they were "for awhile," a law enforcement source subsequently told ABC News. Investigators learned that these two men were returning to Chicago on Feb. 13 from Nigeria and moved in. The pair were detained at the airport, placed under arrest and taken in for questioning. Feb. 14: In an exclusive interview with "Good Morning America" anchor Robin Roberts, Smollett said he was heartbroken when he found out that people questioned the details of his story. He defended himself against skeptics who pointed out that it wasn't until a follow-up interview with the police that he mentioned that the assailants yelled "MAGA Country!" at him. He also complained about erroneous reports that he had told police that the attackers were actually wearing red MAGA hats. In the ABC News interview, Smollett also confirmed reports that he was initially reluctant to contact the police or handover his cellphone to help with the investigation. "They wanted me to give my phone to the tech for three to four hours. I'm sorry but -- I'm not gonna do that," the singer said. "Because I have private pictures and videos and numbers: my partner's number, my family's number, my cast mate's number, my friends' numbers, my private emails, my private songs, my private voice memos." The same day the interview aired, Smollett is re-interviewed by Chicago police investigators. By evening, police sources confirmed that they obtained search warrants and raided the homes of the two individuals, recovering bleach, shoes, electronics and other items. Feb. 15: Chicago police announce that they have identified and are questioning the two "persons of interest" captured on a surveillance video. By midday, a CPD spokesman tells ABC News that the two 'persons of interest' are, in fact, under arrest, and acknowledge that the pair has "a relationship with" Smollett. In an unusual move for an ongoing investigation, police officials who had originally described the two as 'persons of interest' begin describing them as "potential suspects." But by late that evening, investigators changed course and announced that the two men have been released without charges. Feb. 16: Chicago police identify the two men they arrested and later released as brothers -- Olabinjo and Abimbola Osundairo -- both U.S. citizens of Nigerian descent. Later in the day, police said they were "eager to speak to Jussie Smollett" based on the new information they obtained after the interrogations. Police contacted the actor's attorneys and said their "intentions are clear." Yet in a late-night statement from his attorneys on Saturday, Smollett hit back at the suggestion that the incident was a hoax, and expressed disbelief that the brothers could have been involved. "As a victim of a hate crime who has cooperated with the police investigation, Jussie Smollett is angered and devastated by recent reports that the perpetrators are individuals he is familiar with," began a statement from Smollett attorneys Todd Pugh and Victor Henderson. "He has now been further victimized by claims attributed to these alleged perpetrators that Jussie played a role in his own attack. Nothing is further from the truth and anyone claiming otherwise is lying." Feb. 17: The Osundairo brothers, who were interrogated by police investigating the alleged attack on Jussie Smollett in Chicago, told authorities that the "Empire" actor allegedly paid them to help him orchestrate and stage the crime, sources told ABC News Sunday. Feb. 18: The two brothers who were interrogated by police investigating the alleged Chicago street attack on Smollett claim they helped him concoct the assault after he became upset that a letter threatening him, sent to the "Empire" show's studio, did not get enough attention, sources told ABC News. A spokesperson for Smollett said the actor's attorneys are keeping an active dialogue going with Chicago police on behalf of the actor. "We are not racist," Osundairo brothers said in a statement. "We are not homophobic and we are not anti-Trump. We were born and raised in Chicago and are American citizens." Feb. 19: Chicago police say they are following up on a tip that on the night Smollett reported being attacked, he was in an elevator of his apartment building with the two Nigerian brothers. Police later dismiss the tip as not credible based on video evidence. Two federal officials tell ABC News that the FBI and U.S. Postal Inspection Service are investigating whether Smollett played a role in sending a threatening letter before the alleged attack. Chicago's top prosecutor, Cook County State's Attorney Kim Foxx, recuses herself from the investigation "out of an abundance of caution ... to address potential questions of impartiality based upon familiarity with potential witnesses in the case," according to the Associated Press. Foxx's first assistant, Joe Magats, will oversee the case. Foxx had acted as an early intermediary between Smollett's family and the Chicago Police Department, according to a statement released by her office. "Shortly after the incident occurred in late January, State's Attorney Foxx had conversations with a family member of Jussie Smollett about the incident and their concerns, and facilitated a connection to the Chicago Police Department who were investigating the incident," Robert Foley, a senior adviser to Foxx, according to WLS. Feb. 20: Smollett has been charged with felony disorderly conduct for filing a false report after allegedly staging the attack against himself in Chicago, police and the state attorney's office confirmed to ABC News. The charge of felony disorderly conduct carries a penalty of one to three years in jail, according to the criminal statute. Smollett will appear for a court hearing Thursday at 1:30 p.m., officials said. Smollett's attorneys have not commented on the charge. By Wednesday evening, the Chicago Police Department had officially classified Smollett as a suspect in an ongoing criminal investigation for filing a false report. The announcement, in a tweet from the Chicago Police Department's verified account, represents another stunning twist in an investigation that has seen more than its share of such developments. The tweet also announced that detectives are presenting evidence to a grand jury. Meanwhile, 20th Century Fox Television and Fox Entertainment continue to stand by the embattled "Empire" actor, and continue to deny reports that he was or is being written off the hit show. "Jussie Smollett continues to a consummate professional on set and we have previously stated, he is not being written out of the show." Feb. 21: Smollett turned himself in to Chicago police to face a felony charge of filing a false report, a crime that, if convicted, could put him in jail for one to three years. In an emotional press conference, Chicago Police Superintendent Eddie T. Johnson blasted Smollett on Thursday in which he said that Smollett's alleged staging of a hoax attack was a "publicity stunt...to promote his career." "Jussie Smollett took advantage of the pain and anger of racism to promote his career," Johnson said. "I am left hanging my head asking 'why?'. Why would anyone, especially an African-American man, use the symbolism of a noose to make false accusations? ... How can an individual who's been embraced by the city of Chicago turn around and slap everyone in the city in the face with these false claims?" Johnson charged that Smollett, an actor on the hit show 'Empire' who has consistently denied any role in staging the alleged attack, orchestrated it because he was "dissatisfied with his salary." In a new statement on Thursday, 20th Century Fox Television and Fox Entertainment officials said that "[w]e understand the seriousness of this matter and we respect the legal process. We are evaluating the situation and we are considering our options." 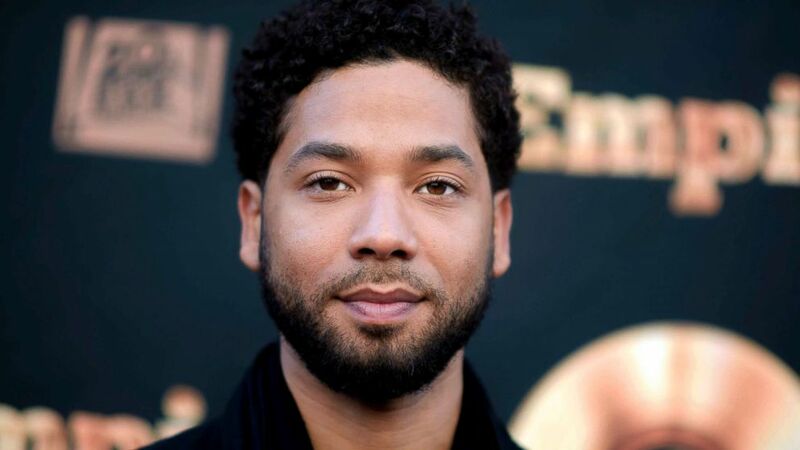 March 8: The Cook County State Attorney's Office announces that the previous day a grand jury indicted "Empire" actor Jussie Smollett on 16 felony counts of disorderly conduct for filing a false police report, according to the Cook County State Attorney's Office. March 26: At an emergency hearing in a Cook County courtroom in Illinois, all criminal charges against Smollett were dropped. "Jussie was attacked by two people he was unable to identify on January 29th," his attorneys, Tina Glandian and Patricia Brown Holmes, said in a statement. "He was a victim who was vilified and made to appear as a perpetrator as a result of fake and inappropriate remarks made to the public causing an inappropriate rush to judgement. "Jussie and many others were hurt by these unfair and unwarranted actions. This entire situation is a reminder that there should never be an attempt to prove a case in the court of public opinion. That is wrong. It is a reminder that the victim, in this case Jussie, deserves dignity and respect." "We found about it when you all did," Johnson said of the lack of notice from the State's Attorney Office regarding the dropped charges. "I'm sure we'll have some conversation after this. But again at the end of the day Mr. Smollett committed this hoax." "A person using hate crime laws that are on the books to protect people who are minorities, and you turn around and use them to advance your career?" Emmanuel said. "Is there no decency in this man?" In a subsequent interview with ABC News Chicago station WLS, the prosecutor who dropped the charges against Smollett told ABC News station WLS that he believes Smollett made a false report about being attacked, but decided to drop the charges anyway. "We stand behind the investigation and the facts revealed," said Joe Magats, the first assistant state attorney who took over the case when his boss, State Attorney Kim Foxx, recused herself from the probe after it surfaced that she had been in touch with Smollett's family. In fact, according to text messages obtained by the Chicago Tribune, Foxx reached out to Johnson and asked him to turn the probe over to the FBI -- though the police department ultimately completed the investigation independently. "We believe he did was he was charged with what he was doing." Asked again whether he believes Smollett fabricated the incident, he replied, "yes." "This was not an exoneration. To say that he was exonerated by us or anyone is not true." "Our goal and our #1 priority is combatting violent crime and the drivers of violence and we look to our resources to do that and I don't think that Mr. Smollett is a driver of violence or a violent individual." Magats also said that he was satisfied with Smollett forfeiting the 10 percent of $100K bond he put up, and completing community service prior to getting the charges dropped. "In return for forfeiting his bond to the City of Chicago and doing his community service, we agreed to dismiss the charges against him. He did community service for Operation Push." ABC News' Stephanie Wash and Bill Hutchinson contributed to this report.